Opposition supporters clash with Venezuelan National Guards during a rally to demand a referendum to remove President Nicolas Maduro in Caracas, Venezuela, May 18, 2016. Opposition leaders and frustrated Venezuelans took to the streets in Caracas on Wednesday to march to the national election board's headquarters and demand a recall referendum to end President Nicolas Maduro's socialist rule. But police and National Guard soldiers blocked the square where protesters planned to meet and fired tear gas at them, witnesses said. "We're tired of this corruption. We're tired of the queues. We're tired that everyday they smack us in the face with this supposed economic war," protester Carlos Rodriguez said in Spanish. Officers with shields, helmets and bulletproof jackets blocked the riot that involved thousands of people. "Recall! Recall! Maduro Out!" protesters chanted while holding the Venezuelan flag or anti-government signs. Maduro gave himself decree powers for 60 days due to what he calls a plot from some Venezuelans and the United States to subvert him. Henrique Capriles, two-time presidential candidate, and Henry Ramos Allup, speaker of the opposition-controlled parliament, led the protests. The opposition believes Maduro's measure shows his government is panicking. "We're talking about a desperate president who is putting himself on the margin of legality and constitutionality," said Democratic Unity coalition leader Jesus Torrealba. 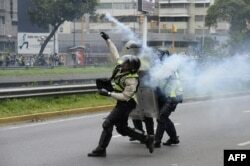 Policemen clash with demonstrators protesting against new emergency powers decreed this week by President Nicolas Maduro in Caracas on May 18, 2016. National polls show nearly 70 percent of Venezuelans now believe Maduro must go this year. But ruling Socialist Party officials said there is no time to organize a referendum this year. "Of course we are going to continue on the street until we get freedom in Venezuela and we get this country on the path to progress," Javier Lopez, another protester, said in Spanish. According to reports, opposition leaders said authorities are trying to delay a referendum until 2017 when the presidency would fall to the vice president, a post currently held by Socialist Party loyalist Aristóbulo Istúriz. But Maduro has vowed to see his term through. The Venezuelan president, a former union leader and bus driver who narrowly won election to replace the late Hugo Chavez, accused the opposition coalition of seeking a coup with the help of the United States. At a rally last Saturday, Maduro said troublemakers were fomenting violence to justify a foreign invasion. "We're going to tell imperialism and the international right that the people are present, with their farm instruments in one hand and a gun in the other ... to defend this sacred land," Maduro said. Venezuela, according to Capriles, is a time bomb that can explode at any given moment. Opposition won control of the National Assembly in a December election driven by anger over product shortages, inflation and rampant violent crime. But the country's Supreme Court prevents congress from passing any legislation. "If you block this democratic path, we don't know what might happen in this country," Capriles said at the demonstration.